A bioengineered version of the Clostridium cellulolyticum microbe can produce butanol directly from cellulose. Butanol is a promising biofuel; it packs more energy than ethanol and can be shipped via oil pipelines. James Liao, a biomolecular engineer at the University of California, Los Angeles, has demonstrated that direct cellulose-to-butanol conversion can be done more cheaply than other cellulosic biofuels. Liao's direct cellulose-to-butanol process, developed in collaboration with researchers at Oak Ridge National Laboratory, promises to simplify things by expanding the capabilities of fermentation microbes. The key was adding Liao's sugar-to-isobutanol pathway to a microbe, Clostridium cellulolyticum, that likes chewing on biomass but does not normally make butanol. The microbe was originally isolated from composted grass, and two years ago, the U.S. Department of Energy's Joint Genome Institute completed a sequence of its genome. 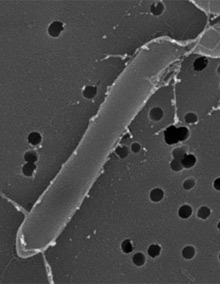 The result of the genetic engineering, published this month in the journal Applied and Environmental Microbiology, is a single organism that takes in cellulose and cranks out isobutanol. Liao says the output and conversion rate are low, but says this "proof of principle" is likely the trickiest part of the development process. "The rest is relatively straightforward. Not trivial, but straightforward. It becomes a matter of funding and resources," says Liao. "They call 'em culture tanks. They have bugs -- germs -- growing in them; germs that eat pretty near anything, and produce oil as a waste product. That's the purpose of the whole business. We dump everything that's waste into the tanks, pump the oil off the top..."